The U.S. House of Representatives has unanimously passed a bipartisan resolution condemning the anti-LGBTQ atrocities taking place in the Russian republic of Chechnya and calling on Chechen and Russian authorities to investigate the crimes and hold the perpetrators accountable. Since early this year, Chechen authorities have rounded up and detained more than 100 men in secret prisons, under suspicion that they are gay or bisexual. Chechen leaders have denied these accusations, going so far as to deny the very existence of LGBTQ people in Chechnya. Nonetheless, there have been numerous verified reports of torture and at least three and possibly as many as 20 men have been killed. Chechen officials have also reportedly encouraged families to murder relatives they suspect might be gay, something that at least one family seems to have acted on. The resolution, introduced by Rep. Ileana Ros-Lehtinen (R-FL) in May, calls on Chechen officials “to immediately cease the abduction, detention, and torture of individuals on the basis of their actual or suspected sexual orientation, and hold accountable all those involved in perpetrating such abuses.” The resolution also includes language from Rep. Bill Keating (D-MA) calling on the U.S. government to identify those involved in the attacks and determine if they could be sanctioned under U.S. laws. It also calls on the U.S. government to continue condemning the atrocities. To date, the only high-level U.S. official to make a statement on Chechnya is the U.S. Ambassador to the United Nations, Nikki Haley. Neither President Trump or Secretary of State Rex Tillerson have weighed in. Tillerson even admitted at a recent Congressional hearing that he has not raised the situation with his Russian counterparts, an admission that HRC’s Stacy called “beyond disturbing." 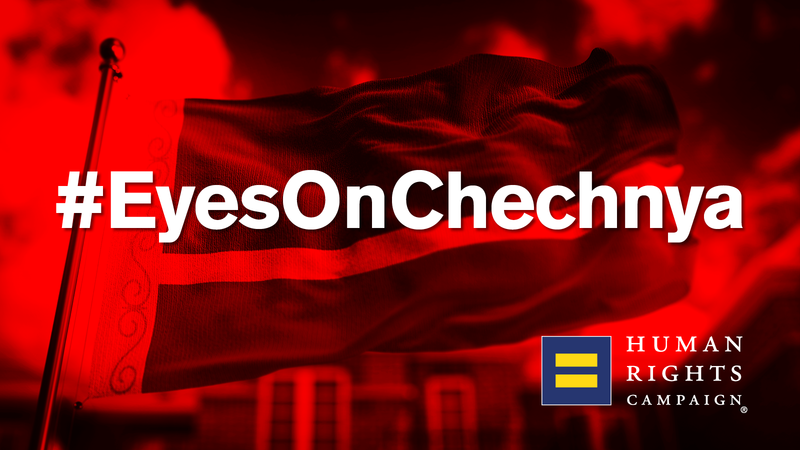 HRC through its #EyesOnChechnya effort is continuing to take action to stop the atrocities and help the victims. Click here for background information and actions that individuals can take to help end the violence.